Don't blame PowerPoint. Since the overhead projector was invented in the 1950's, people have gotten into the habit of having one-way presentations that usually don't resonate with their audiences. Combine that with 50-plus years of an industrialized top-down culture of instruction, and most people think they have to produce a TED Talk to present their products and services. But this is not true; TED Talks aren't sales pitches anyway. Based on the principle that people hate being sold to—but love to buy—this webinar will focus on a how you can transform your presentation into a genuine conversation with your audience, regardless if you are presenting to one person or a thousand. 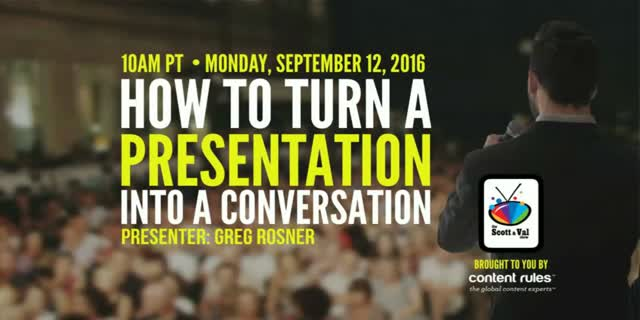 Most people hate public speaking because presenting is hard; but conversations are easy. The only way you will get your prospect to turn into a customer, or the audience to turn into fans, is to engage them and give them a voice. Having conversations is much easier and natural for people than presenting. The future of presentations is about knowledge-sharing and the experience that happens when you have a conversation that translates into action. Join Scott Abel (The Content Wrangler) and Val Swisher (Content Rules) for a presentation from—and discussion with—Greg Rosner—on a different approach to presenting. In this session, we will weave the conversation around three things: 1) a rubric for transforming a presentation into a conversation; 2) suggestions for free and paid technology you can use to enable voting, polling and word clouds; and 3) a mindset to use when going into your next presentation that will transform meeting outcomes.